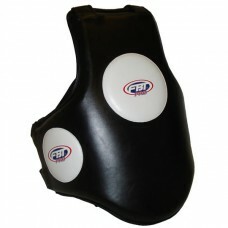 Fairtex original Trainer’s Protective Vest designed for punches, hooks, foot jabs, knees and combination drills with front and side white hitting targets. Constructed of Fairtex Syntek Leather and four-layered padding system of hard outer padding and extra soft inner padding for ultimate shock absorbency. Lightweight contoured design for comfortable wearing for extended periods with shoulder and waist clip straps for ease of use.